One of the benefits of being around children (especially another’s) is how much one learns about one’s self. This month I took a group of our youth club kids to Centre Parcs for the weekend and the learning curve became much more intense. How kind, thankful and giving some are and how much some others reflected back to me some of my worst traits, allowing me to remember how I was as a youngster, how far I’ve come, and yet how much I still have to learn. I guess that reflection is the same for everyone we meet in life, but so much more so from children because they’re more spontaneous and haven’t yet learned to hide their true emotions. Most of all, though, I find children fascinating because of their zest for life; it’s the one thing they exhibit so much better than us. 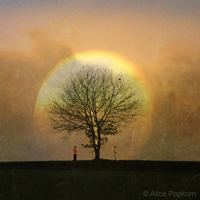 How have we learnt to hide in our thoughts and fears and mask these wonderful emotions, I wonder? Protection, no doubt. When kids’re up, they’re really up. When sad, they let it all hang out. Yes, it can be exhausting on both levels (maybe because of that reflection), but isn’t that truly a great way to be? 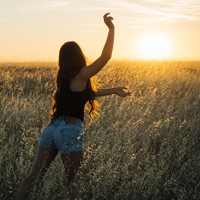 Just letting go has become so alien, many of us need external stimulants like alcohol or drugs to tear down the barriers and enable us to really let go. This weekend, without any of these stimulants, I remembered how to ‘Dance like no one’s watching and Sing like no one is listening…’ and it was wonderful. If it takes a child to remind you (yours, or another’s), my advice is to hang out with them soon. But best of all, why not try it now… today… by yourself! Come on, get that radio on and throw hell to the wind! I just know you want to! OK, so we have a lot to get through this month with some stunning new artists, but first I want to thank The Artist magazine for asking me to write a feature for them. You can read this here, if you’re so inclined. Not only that, I’m doing their first Facebook live podcast at 11am on 7th April so if you’re a Facebooker and want to have a chin-wag about artist/gallery relationships, I’ll be here then. Hope you can make it with a cuppa and a custard cream. 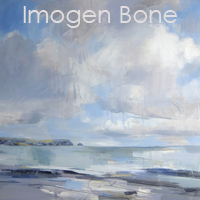 So with no further ado, I want to introduce you to THG’s newest artist, Imogen Bone. I’ve been a big fan of her work for years and am delighted she’s decided to join us this season and has painted six astonishingly beautiful pieces just for you! Hope you love them as much as Debs and I do. She’s smashin’! 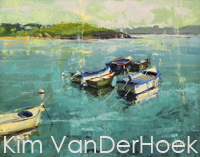 Kim VanDerHoek’s works are now in from California and I’m just having them framed, so make sure you check those beauties out. And I’m delighted to say, that fabulous Robin Mason is just finishing off his last few pieces ready for the first of the year’s Fisherman’s Shelter exhibition from 15th – 17th April. They’ll all be live online the day before the exhibition for all those who cant be there, so you can get a first-glance here then. 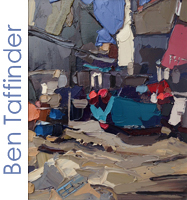 And we have Ben Taffinder’s annual exhibition running in the gallery from 28th April through till 7th May as well. I haven’t seen that collection yet, but it’ll no doubt cause a stir once they’re in. Again, they’ll go live here the day before the exhibition start, so put the 27th April in your diary, Taffinder fans! 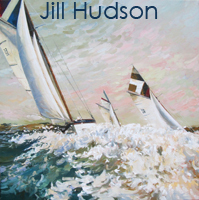 And just yesterday, the lovely Jill Hudson bought in two cracking new pieces for us. I suspect they won’t hang around for long so ‘ave a butchers at them corkers. 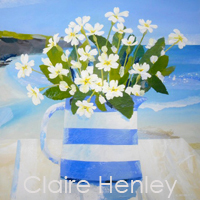 Oh and this Claire Henley of Primroses at Porthcurnick has just gone live, so I’m counting the seconds for that one to sell! Sales from Tom Marsh, Joe Armstrong, Stephen Higton and Julian Mason will see new works on their pages any time soon and everyone’s starting to refresh with 2017’s quality works so make sure you keep popping in to your favourite artist’s pages throughout the month… once they’re gone, they’re gone! OK, that’s it for this month. I hope to see you on Facebook on 7th April but otherwise, look forward to hearing from you or seeing you in the village soonest. Till then, here’s to a fabulous Easter and wishing you heaps of choccy Eggs and festive treats… you deserve it! As I get older, I find my patience challenged more and more. In those weak moments, especially if I am tired, it’s incredibly easy to ‘lose it’. But once I do, although I feel an instant weight of relief for having vented, a feeling of guilt for having ‘passed on’ that negative energy to someone else overcomes me.